Look no further than the Bezrat Wine Decanter. It is everything you would need to class up your home or bar, display your wine for your guests, or make life easier for yourself. Pouring the wine from the bottle to the decanter also oxygenates the wine and releases its rich aroma and flavor. Can fit more than 2 standard size(750ml) wine bottles. Thin neck makes it easy to hold. Easy pour slanted spout avoids spilling and dripping. 100% LEAD FREE CRYSTAL. Our hand-blown, lead-free crystal adds radiance to any room. Impress your guests, amplify the ambience and enhance the purity ,aroma, and taste of your favorite red wine with our wine pourer. Makes the perfect gift. The ideal gift for wine lovers, enthusiasts, mom, dad, grandparents, and more. 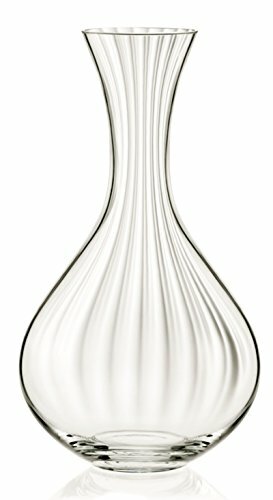 Display your best wine, whiskey, or liquor in this beautiful glass decanter. Sophisticated, modern decanter beautifully overlooks your bar, proudly displaying your best wine, whiskey, or liquor. Classy, decorative shape that can make a lovely centerpiece for wedding tables, complementing other decorations. Perfect for decanting a standard size bottle of wine (750ml) and the full capacity is 1500ml/50oz. If you have any questions about this product by Bezrat, contact us by completing and submitting the form below. If you are looking for a specif part number, please include it with your message.